Each week in our study of visual design we have added a dimension: starting with one (the line) and then two (shape). This week we will add the third dimension (known as form or volume). Yet the photograph itself is still a two-dimensional representation. The keys to emphasizing form and volume in photography is through deliberate use of light and perspective. The direction of your light is important in determining the appearance of form and volume. 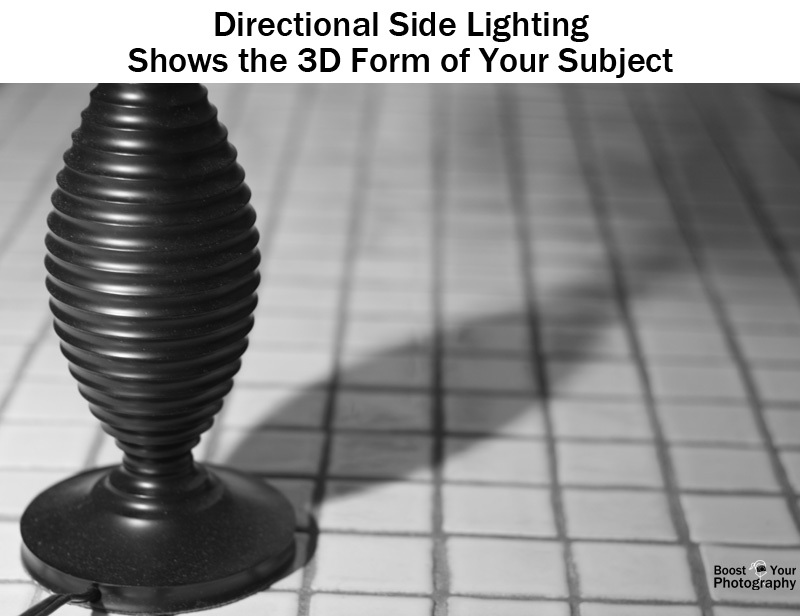 The ideal lighting for emphasizing the form and volume of your subject is directional side lighting. 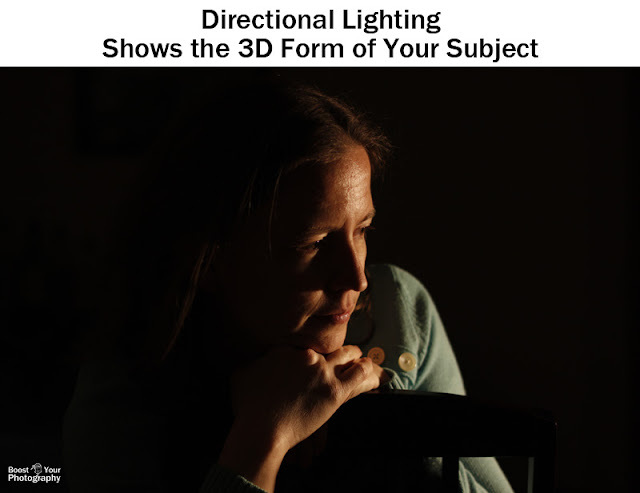 When light is coming from a single direction off to the side of your camera and subject, the interplay between light and shadow allows the viewer to better understand all three dimensions. For the self-portrait above, I used a single desk light for illumination. 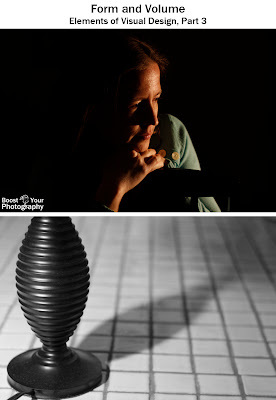 To limit the light from spreading out and illuminating any of the background, I made my own "snoot" by wrapping a cone of black paper around the light. The light was positioned perpendicular to the camera direction and off to my left. This creates the strong shadows across the hand and face that draw your eye to the three-dimensional form of the face. The best way to really see and understand the connection between light and form is to experiment for yourself. Choose a simple subject with a noticeably three-dimensional form (for the example below, I used a lamp base). Find a clear and uncluttered spot to shoot, so you can focus on your subject. (You can use a tri-fold board for a simple background, if you wish.) Shoot in a dark room or at night so that you can control the light. To make it easier on yourself, consider shooting with a tripod and remote, so that you can leave your camera and focus set. Grab a small light source, like a narrow-beam flashlight or a desk lamp. Wrap some black paper as around your light source so that you have a narrow beam of light. Turn off any other lights in the room. Stand behind your camera, shine the light on your subject, and take a picture (front-lighting). Then move the light around to one side and take a picture (side-lighting). Finally, move the light around so that it is behind your subject and take a picture (back-lighting). Try also moving the light up and down in those different positions. How does your subject change? 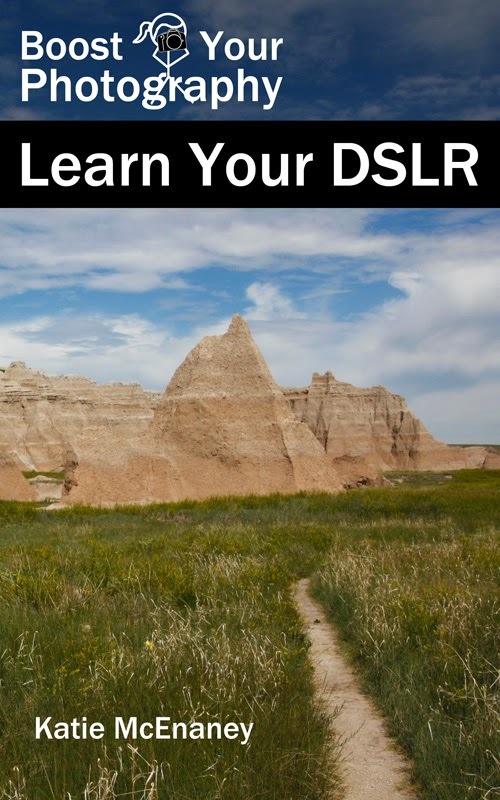 How do the changes in the shadows and light direction affect how your eye sees the form and volume of your subject? If you are having trouble seeing and shooting while moving the light yourself, consider watching this video demonstration. His focus is on learning to see and understand light, but you can also simply watch the egg as the light moves around it and think about how your perception of the egg's form and volume changes. How Will You Use Form and Volume? Consider sharing your experiment shots with form and volume this week. Or, put your learning into practice and seek out a situation where your photograph emphasizes the form and volume of your subject. 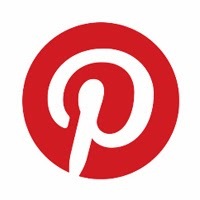 Share a link or a photograph in the comments below, or consider joining the BYP 52 Weeks Google+ Community to share your weekly photograph and see what others are capturing.